We all love St. Patrick’s day. Why? Maybe it’s the excuse you need to go have cocktails with your friends and the new ones you’ll make at one of our NoHo bars. Or maybe it’s because you get the green light to wear that horrible green shirt you break out once a year in March. Well either way, there’s no need to look bad this St. Patrick’s day. So we asked color expert Jill Kirsh for some help. Question: Can You Actually Wear Green Without Looking Green? Answer: Yep! So how does one find the proper green and not the grody green? Look at your hair. Jill Kirsh has designed a unique and innovative color system for your wardrobe and your makeup that's entirely based on your present hair color. Yes, on your hair. She’s broken it down into the following simple and fun categories that work - Deep Brunette, Warm Blonde, Golden Brown & Red, and Ash Blonde, Platinum & Gray. She’s even put together a handy wallet-sized swatch book filled with fabric of all the best shades of every color for each hair color group. Take it with you shopping as it is your guide to what color you will look fabulous in and can be used from everything from tees and trousers to party dresses and stilettos. She’s also created mineral based, fragrance-free makeup kits with all your best shades for the eyes, cheeks and lips. So Jill took the some famous celebs and chose the best shade of green for each of them. Elle Fanning’s Warm Blondes tresses shine against the warmth of Kelly Green. 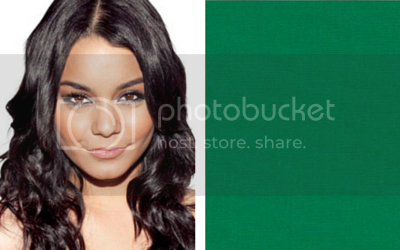 Deep Brunette Vanessa Hudgens totally rocks in a Deep Emerald Green. Christina Aguilera’s cool white blonde is amazing against the cool undertones of Seafoam Green. Emma Stone’s fiery red hair is stunning against the warmth & richness of Olive Green. Find your color green with Jill Kirsh!